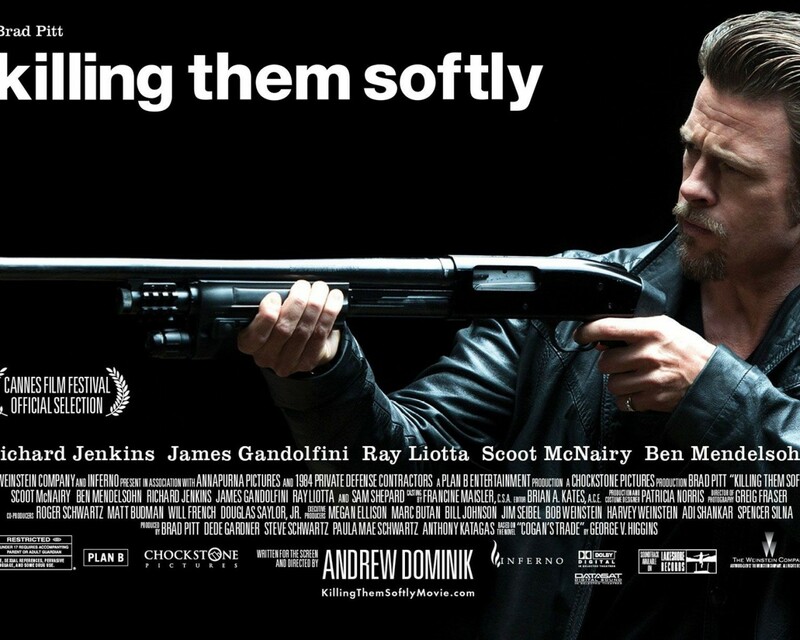 Quickfire Review: Killing Them Softly (2013) – Hooray For Movies!! Synopsis: Jackie Cogan is an enforcer hired to restore order after three dumb guys rob a Mob protected card game, causing the local criminal economy to collapse. Andrew Dominik is not a film maker who likes to be rushed, having only made 3 films in the last 12 years. When the first two are debut Chopper (2000), the bio of Aussie hardman Mark “Chopper” Read that launched Eric Bana’s career, and The Assassination of Jesse James by the Coward Robert Ford (2007), a near perfect western starring Brad Pitt as the infamous outlaw, the bar is always going to be set a little higher than normal for the third. Killing Them Softly, based on George Higgens’s novel Cogan’s Trade, doesn’t reach the cinematic heights of the last two, but it still remains an enjoyable Tarantino-esque thriller. Set in 2008 New Orleans, a city still reeling from the devastation of Katrina and now feeling the compounding pain of the economic collapse in 2007, two fairly dimwitted crooks (Scoot McNairy and a delightfully repulsive Ben Mendelsohn) are tasked by a local criminal to knock off an underground card game run by Markie Trattman (Ray Liotta). The hook? Trattman previously knocked over his own card game and got away with it so everyone will think he did it again leaving the three of them to get away scott free. Unfortunately things are never as easy as they seem and mob “cleaner” Jackie (Brad Pitt) is tasked with sending an unequivocal message that you can’t collapse the local criminal economy and get away with it. There have been man, many films about the reasons behind the economic collapse in the later part of the last decade, and plenty about the various facets of society affected by it. Killing Them Softly doesn’t deal with it head on but rather uses a significant amount of stock footage and soundbites from McCain and Obama’s campaign as backdrop to the discussion on screen about the fragilities of the local criminal economy, the affects of poorly thought out greed and get rich quick schemes and the requirement for silent parties to restore order at any costs. The most pointed of these discussions tend to take place between Pitt’s sharp, suave fixer and Richard Jenkins’s crooked lawyer who is the spokesperson for a faceless group who want to keep the money flowing and get vengeance in the process. While it is an interesting device initially it can quickly become a distraction as you feel like you are watching a gangster campaign video. Also Dominik tries a little too hard at times to capture that Tarantino vibe when a more disciplined hand should have cut certain scenes short, more often than not involving rambling back and forth between Pitt and James Gandolfini’s drunk and past his best hitman brought in to help Pitt finish the job. Great review man, you sound like you appreciated this a touch more than me but I agree with you on the quality of the cast. They are all great and Pitt especially was brutal. Even though I didn’t like this as much as you, you are right about the Tarantino-esque-ness. I felt the long dialogue scenes between some characters were meant to be as interesting as Tarantino’s but dragged. I did love what happens to Ray Liotta’s character, in hyper slo-mo. Very well thought out review! Great work! Good review. It was a slow-burner for sure, but man, the cast is so good here that it almost didn’t matter. I was just too busy enjoying the hell out of myself.